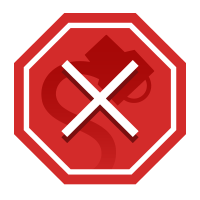 FACT CHECK: Is Starbucks Installing 'Shatter-Proof Windows'? An image circulating online falsely promised "free coffee for a year" to anyone who could damage the company's new windows. 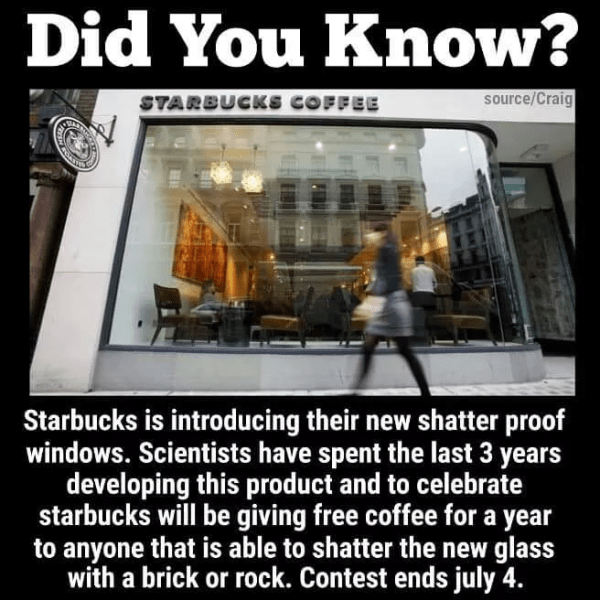 Starbucks is giving away free coffee for a year to anyone who can damage their new "shatter-proof" windows. The company confirmed to us via email that the claim pushed in the meme was false. The image circulated shortly before 29 May 2018, when Starbucks was slated to temporarily close all of their U.S. locations to train their employees on recognizing racial bias. The closure and training was spurred by a series of protests against the coffee shop chain for the arrest of two black men, Rashon Nelson and Donte Robinson, at a Philadelphia Starbucks, an incident that became a national story. The two men were ultimately released without charges and reached an undisclosed financial settlement with the company. However, for years even before that 2018 incident the Seattle-based chain had taken precautions against vandalism at its flagship roastery in the City of Brotherly Love: the company had boarded up the Capitol Hill roastery and closed multiple stores early in anticipation of annual May Day labor protests. The roastery did not report any damage during the 1 May 2018 edition of May Day protests. Business Insider. 1 May 2015.